Well it was billed as the LEFA Summer Solstice Shoot,note the summer part, it didn’t feel like summer. Windy with some very heavy showers it felt very autumnal as we arrived. This weather made the shoot very challenging to say the least as the ground became very slippery under foot with myself and fellow archer John both falling. Fortunately neither of us sustained any real damage other than a a few thorns, though at one stage we wondered whether John had strained his hand. 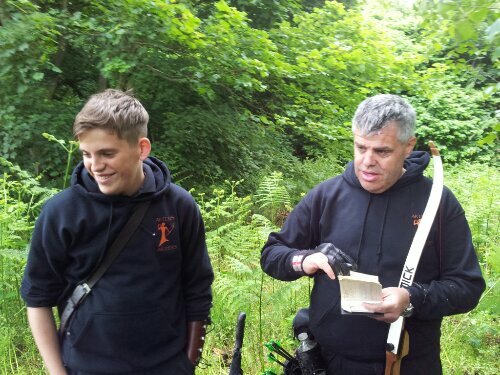 For the day we were joined by father and son double act John and Ben Straw. Not sure what they are feeding Ben but I’m sure he’s grown again. The course was a full 40 target 3d one with mixed sizes of targets and distances, with the normal break for lunch for an hour. LEFA had over 200 archers attend and devour the food off the lunch menu. 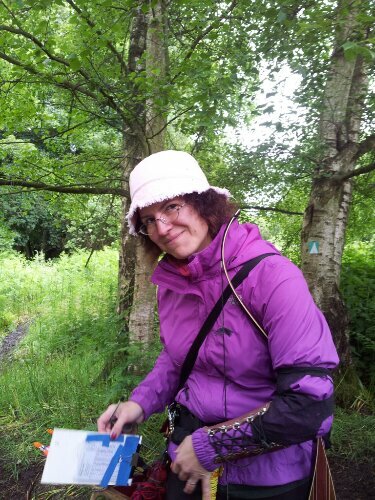 Fortunately the heaviest showers weren’t during the lunch break or I think we might have been even wetter. I know a few people retired at lunch, due to weather I think. As I said the poor weather made the ground slippery but also had the effect of lowering the tree canopy making some of the longer targets very difficult for lower poundage bows or for longbows that have a long cast. It also meant arrows would catch the canopy and skip off into the undergrowth. Resulting in time lost searching for arrows, John lost 3 this way. LEFA have come under criticism for the shoot being too hard and not up to their usual standard. I think this is a little unfair. The shoot was challenging with some targets being further than normal but not all and I have been to other shoots that have been far worse. The weather played a major part in the problems on the day and I’ve tried to summarise the issues here. Rain made people wet and wet archers get cold and grumpy. Kids get tired, feather fetchings become useless or at least less effective. The can’t do much about weather, believe me I think there are many that would love to be able to. Paths became slippery due to the rain which slowed movement. Short of laying new paths etc not much can be done. Maybe a few steps or ropes hand rails might have helped but they had tried to cut in steps they just got worn away. Despite all these problems it was still a good shoot, just not one of their best. 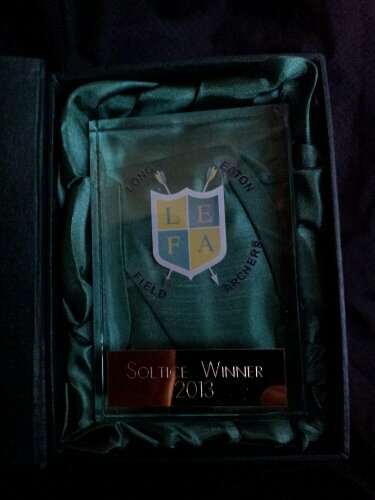 So thanks to all the guys at LEFA. Dead ground was used on a number of shots and so was the undergrowth to hide distances. Though I think shorter archers suffered as the bracken seems to have shot up. Sharon had an off day, we all have them and when it happens there is little you can do. But it was one of those days for a number of archers and it saw her not shooting as well as she can. Ben too was having an off day though he has swapped arrows recently, new bow limbs and has not been practicing due to school commitments. 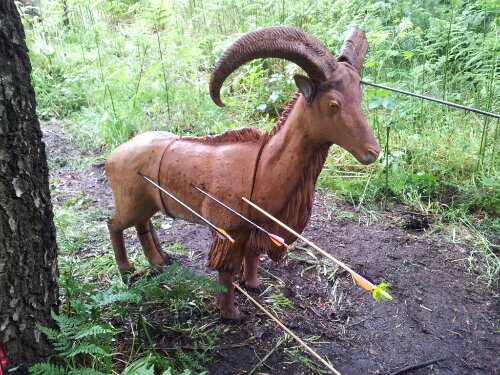 Though I think Sharon had the shot of the day on the goat with a great 24. Well done. One thing LEFA did do is angle some of the 3d targets and this made it harder to judge size and distances. It also resulted in a few glance offs. The afternoon was slow not due to catching the group in front, more to do with taking our time to navigate the slippery paths, fortunately the weather improved (rain stopped) which is why there are no photos of the morning. My camera was buried under waterproofs. I know some people may have been put off returning to LEFA but we will, just not next time as we will be course laying for our shoot. Oh, how did we get on? Almost forgot. Despite Sharon not shooting well she won gold with 518, Ben won in his class too, John retired as I think weather and his hand was giving him grief. I also won in my class with 618. Not too bad considering I didn’t get any 24s all day. It was only the second time Sharon and I have both placed 1st at a shoot.